Published on July 27, 2010 in COP, Elections, General T&T, Media, People's Partnership, PNM, Politics and UNC. 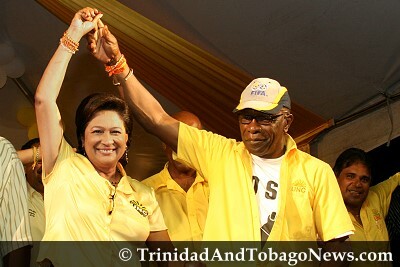 14 Comments Tags: Jack Warner, Kamla Persad-Bissessar, Keith Rowley, Politics. T&T must never go back to the days of the “old corrupt, arrogant, self-serving politics of the past,” says Prime Minister Kamla Persad-Bissessar. Significantly two of the three MPs, Diego Martin North East MP and former Works Minister Colm Imbert who was also an aspirant to the PNM political leadership and Amery Browne were absent from the local government election campaign.